It's hard to believe that I've been away from the mountains for 3 days already. Back in Falmouth, back by the sea. 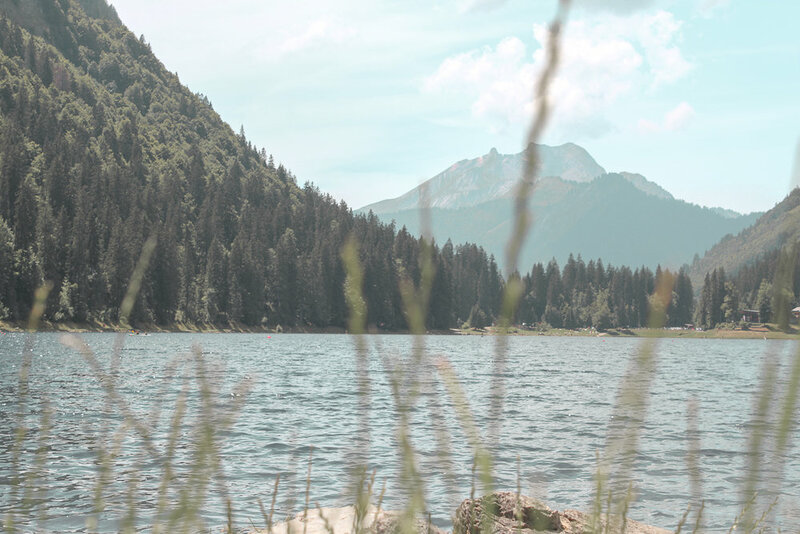 I've been putting my blog on the back burner, because as much has I loved being out in the mountains for the summer, it really did take a toll on me. My job was great, and I loved it, but it was a lot more responsibly than I have ever had. Balancing so many factors, and working with friends was a new experience for me. I love this blog because I get to share with everyone what I've been up to and share how great being abroad is. I'll share with you a few of my favourite places around Les Gets, the small town I lived in. Lac Montriond is the bomb. It's a little bit out of the way, 2 bus rides and a short walk from Les Gets, but WELL worth it! It offers, paddle boarding, kayaking, canoeing, a kiddie pool and glacial freezing water. 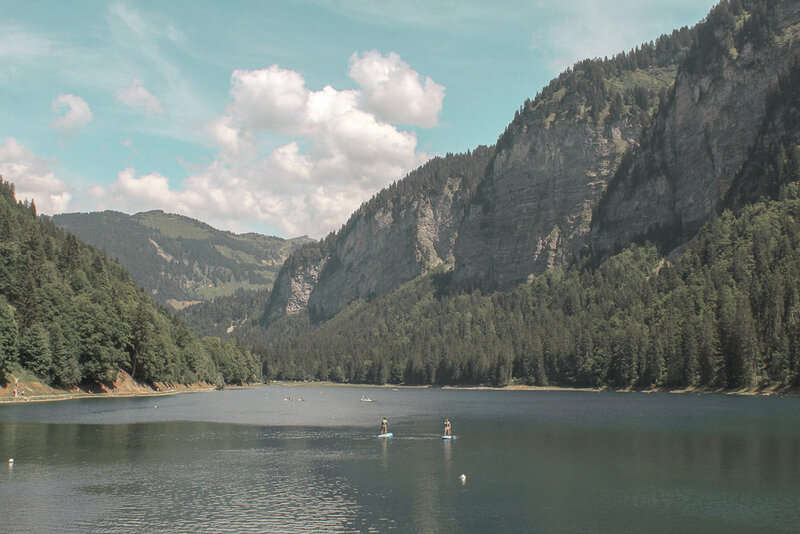 The views are incredible, as you travel from Morzine up in the the valley to Ardent. In the winter, you can ski from Avoriaz to Ardent, then pass by the frozen lake. It's a great place to go with kids, or the whole family, on a date or even on your own. There are trails that all around that go deep into the woods, or up to view points. When I went on my own one time, I accidentally started to walk through a campsite which was hosting, what we call in canada the "Girl Guides". I was so embarrassed... as I was on my phone and looked up with about 50 girls around a camp fire to my left. Needless to say, I ran quite quickly back to the trail haha! Avoriaz is another beautiful place, known mainly for it's skiing. It's at a higher altitude than Les Gets, at it's highest 2400m. It's easily accessible by either car, hiking or by the lift system. It's a bit of an odd place, because it was designed specifically as a ski resort in the 1960s, so it doesn't have the classic french alpes feel. It is also called the "Saint Tropez de Neige". The town was loosely inspired by some of the ideas of famous Swiss architect Le Corbusier, who I love and studied a lot at uni. The buildings are designed with acute angles and a close similarity to the mountains that surrounded them. Because of this, Avoriaz blends in very well with the mountains. 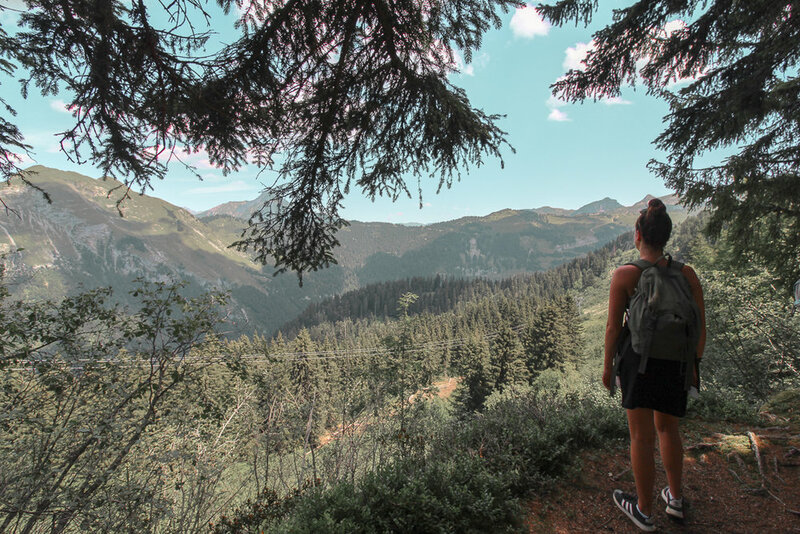 Morzine is the biggest town next door to Les Gets, and is a great place to go for a little bit of activity, especially when I ran out of things to do in Les Gets. It's a hub of the area, and really connects all the towns. You can do the luge, go paragliding, hiking, tons of mountain biking and there's a huge outdoor pool as well. It always has events going on, and the nightlife is a bit more wild than Les Gets. Mont Chery has to be one of my all time favourite places near Les Gets. It's a cable car half way up, then a chairlift to the top. From the top you can hike down towards Mont Caly, or just walk down the roads back into Les Gets. The Belvedere cafe is half way up and is a great spot to stop and enjoy the views of Mont Blanc on a clear day. I love the surprise of walking down to see where the cows are that day. I've even stumbled across many horses and fed them an extra apple in my bag! 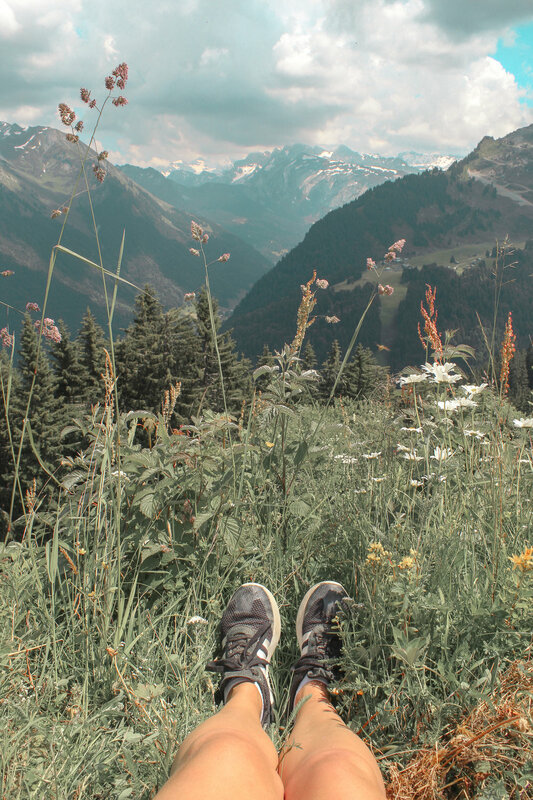 I'd often go up here on my time off to read or run or hike if I needed a day alone! Pointe de Nyon was an incredible find! Accessible by car and then chairlift, or by hiking if you are brave! 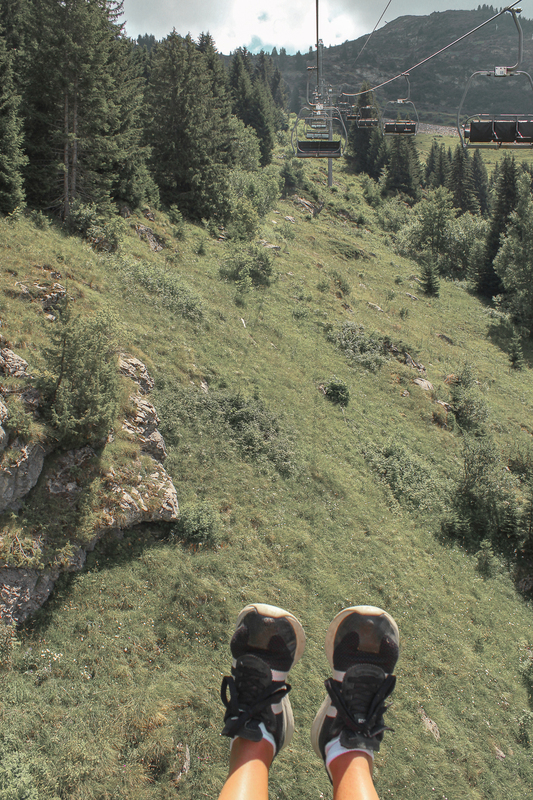 I took the lift up from Les Gets, and then hiked over the ridge to the plateau of Nyon. From there I took the Nyon lift down, and then, unlike in the winter, I hiked all the way up to the very top! From this height you can see 360 views including Mont Blanc at 4000m in the distance. It was such an exhilarating feeling to be all alone at the top of a huge mountain. I even took up my laptop and worked on a few design projects while I was inspired. Thank you so much for reading, if you read all the way through please give my little blog a like so I know that even one person has read this!